My youngest son is fundraising for an upcoming pilgrimage to Spain and Portugal with his church youth group. This is my third pilgrimage in the last five years, so I’m experiencing a little fundraising burnout. Nonetheless, when they decided to do a silent auction and wine tasting this spring to help top off their funds, I agreed to contribute something for the auction, of course. The hubs and I will be on our Caribbean junket at the time of the event, so I figure it was the least I could do. I could have gone out seeking donations for the silent auction item I’d agreed to provide — and believe me, I thought about it! But when I really thought about it, I was convinced I could come up with something on my own. After all, I’d boldly listed “Spring Home Decor Array” as my item of choice. Not a gift certificate for private golf lessons, or signed sports memorabilia, or a weekend at a mountain cabin. Spring home decor. And there it was. The challenge. The No Spend challenge. 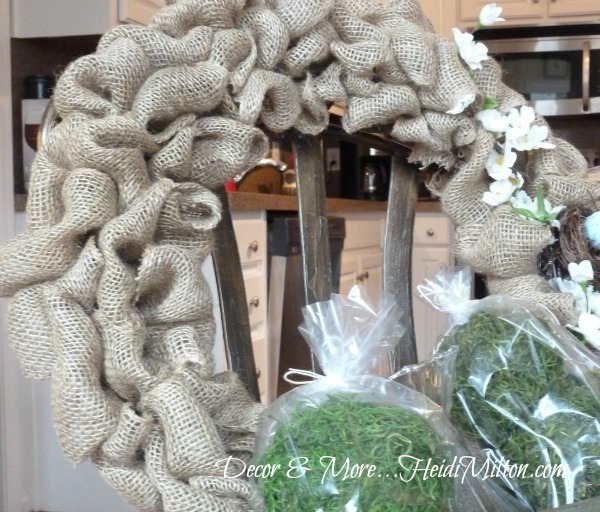 When I think of spring decor, I think of something fresh for my front door, a cute planter to refresh the front or screen porch, and anything to bring green into the mix. With that in mind, I was off to the races. 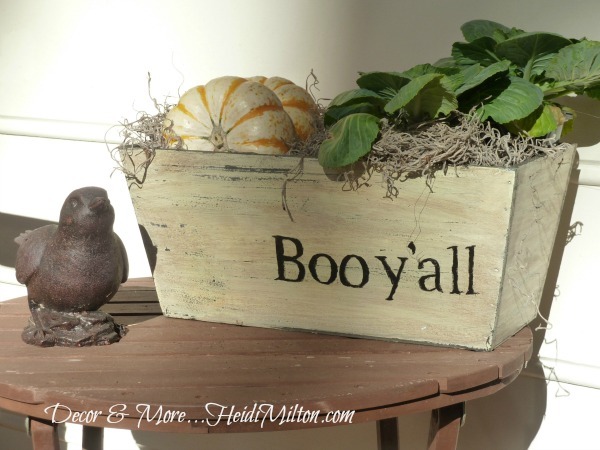 The planter was similar to the one I used for this fun fall project, just a different color. 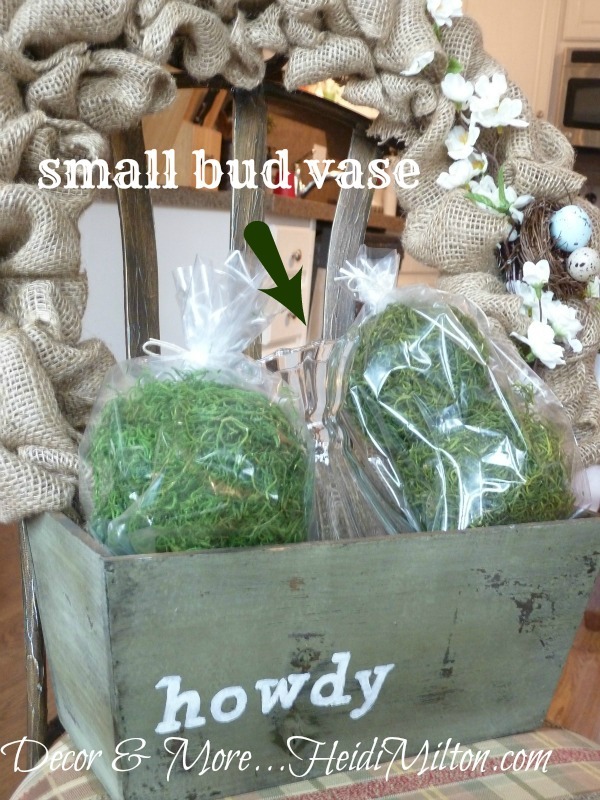 I used the greenish gray planter and white craft paint … isn’t it fun? I then added two spring picks — one sprig of white cherry blossoms and a little nest with two eggs in it. 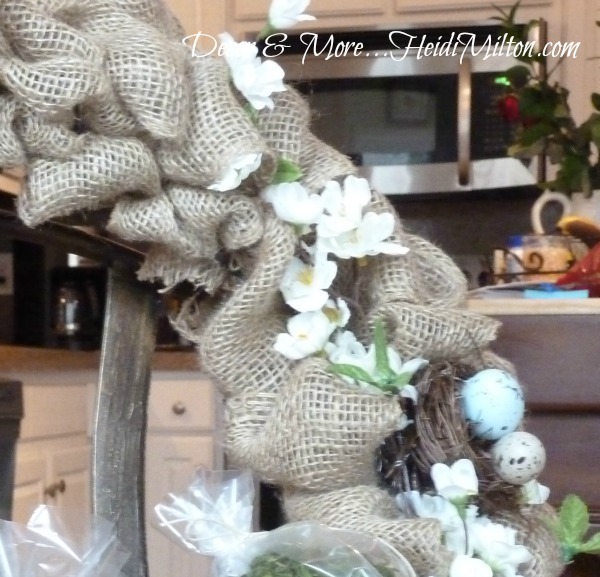 I attached these with floral wire, so they’d be easy to detach when spring is done, if the lucky winner wants to put something else on the wreath. I then used my styrofoam balls and the moss to create — wait for it — moss balls. I know. Inspiring isn’t it? 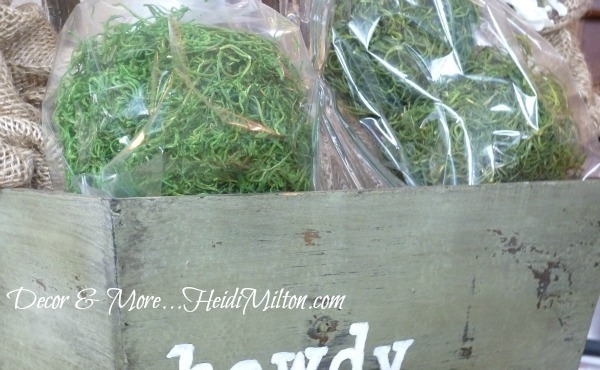 🙂 But I do love that look to bring a little green into your decor for spring, they can be used in any container, plus I wanted to make a few for myself, so what the heck? I did one large and two medium-sized balls for the auction item, and put them in cellophane bags to help preserve them until they’re pulled out to enjoy. One last little touch was a small glass bud vase out of my Willow House samples… it’s hard to see in this photo, but it’s a sweet little fluted number. So there you have it — my silent auction donation that cost me no more than a few afternoons at my kitchen table. What’s got you thinking about spring? cute!!! 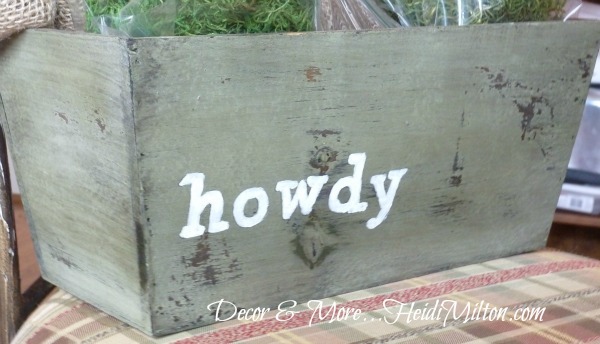 i love the howdy! Now that will certainly be a hit for the silent auction…great idea Heidi…and Laura’s tutorial is the best!!! Hope yall raise lots of money for the trip! Amy@BuffaloRoam recently posted..That Time I Failed at Life. I’m still pouting I’m not going with you to St. Thomas. Amazing creations!!! I’m loving your no spend freeze!! You are doing amazing!! Such an inspiration!